Why am I required to use Pitney Bowes E-Z Seal® Sealing Solution in my postage meter? Companies require you to use a sealing solution in you postage meter and inserters for many reasons. 1st thing to note is that when they require “a sealing solution” it does not need to be E-Z Seal or any specific brand sealing fluid for that matter. 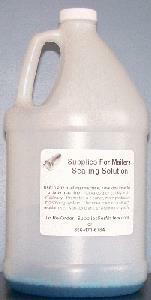 As long is it helps prevent mold and corrosion like the sealing fluid from Supplies For Mailers. 2nd it is very important for maintenance reasons! As a technician, I can tell you it is easy to tell when a client has not been using a sealing solution. They have created a science experiment that grows mold. The mold grows in the tank, on the wick, in the tubing and ends up clogging up the system. The worst part is, the technician then tries to replace parts in the area and soon finds rusted screws and corroded metal. Sometimes even corrosion on the electrical contacts! Now what should have been a quick repair or adjustment, becomes a project, and the technician gets upset because now he has to inform the client that the repair will not be covered under contract and it’s going to cost as much as $700 to replace the sealing assembly! I even had a customer go as far as taking some blue dye and bleach and adding it to water to serve as sealing fluid. Until the bleach corroded the plastic and made the tube so brittle that it cracked and leaked all over the place. Now I know the original is a bit expensive, costing about $29.49 per gallon! Better yet, use the gallon bottles to refill the smaller containers like 604-0 For Pitney Bowes Machine Series: 5600, 5621, 5630, 5650, U560, U570 and save even more! Please be kind to your machine (postage meter or inserter) and your technician and use good sealing fluid! It will save you downtime, money, and as a technician, I will be very happy if I never need to fix another moldy corroded machine!